How does this mid-price horizontal compare to the top models? 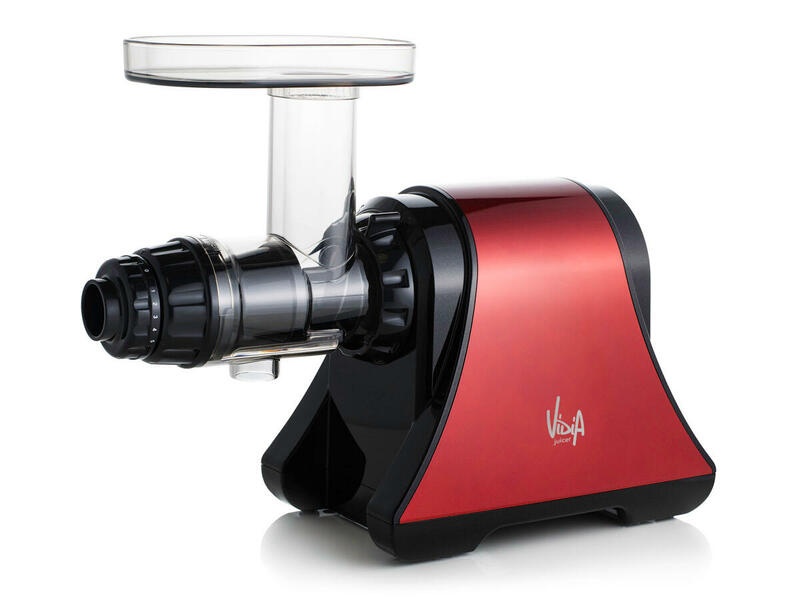 Unlike almost all similarly-priced horizontal juicers, the Vidia SJ-002 is not made in China. Instead it is manufactured in South Korea as are the premium juicer brands like Omega and Sana. This is reflected in its sturdiness, solid construction, and premium feel. Compared to cheap competitors, this model is light years ahead. It is also fairly compact, but not as small as it looks in photos. In fact, it is about the same size as a Sana 707 or Omega NC series. Looks are subjective, but we like the "industrial" styling of the Vidia. It doesn't match the sleek look of the Sana 707, but it is definitely eye-pleasing, especially in red. The only area in which it falls short is the included accessories. While it comes with a full set of food-processing nozzles and a homogenizing screen, it lacks the coarse screen found in some premium models. It also uses a rather standard (but BPA-free) plastic juicing bowl and pulp catcher. We prefer the glass and stainless steel versions found in the Sana 707. 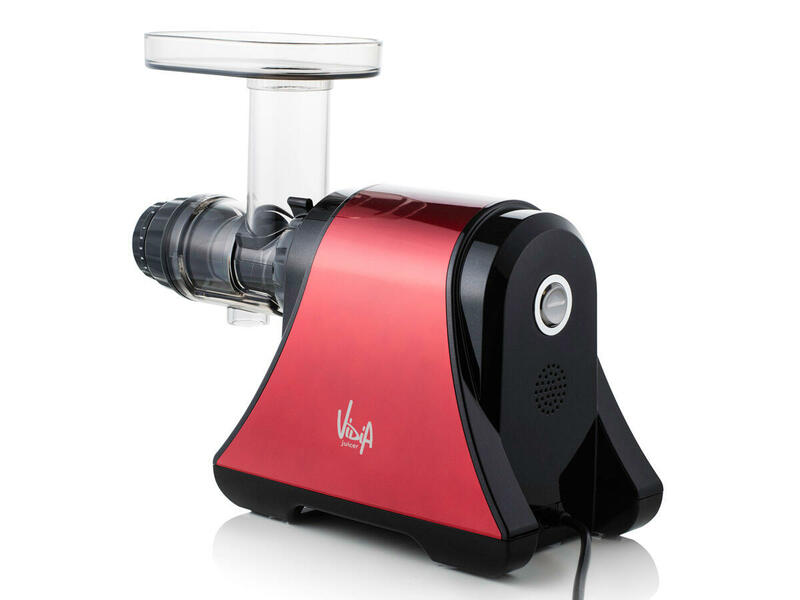 As with any horizontal juicer, the Vidia SJ-002 is straightforward and easy to use, with the only controls being the ON/OFF/REVERSE switch and the pulp regulation knob. We liked the wide feeding tube, and the high rim around the tray. Often when juicing spinach we have a problem with leaves falling from the tray into the juice, but the high rim kept those leaves on the tray where they belong. Another useful feature - something we hadn't seen before - was a little hook on the pusher allowing it to be hung from the top tray. Disassembly was simple, making cleaning fast and easy. We tested the Vidia horizontal juicer with carrots, apples, and spinach - our standard "go-to" ingredients. We also tested the homogenizing screen with peanuts to make peanut butter. It performed superbly in all these areas. Performance was equal to the top horizontals in terms of speed and yield. It also handled peanuts with no problem, making a tasty nut butter with one processing cycle, plus some added peanut oil. The 200 watt motor handled everything without any sign of slowing. We found the pulp regulation knob to give a slight increase in yield when set on maximum pressure, but it wasn't significant. We did miss the coarse juicing screen found on the Sana 707 which would allow better results with pineapple and soft berries, although removing the pulp regulation knob helps with those kinds of ingredients. 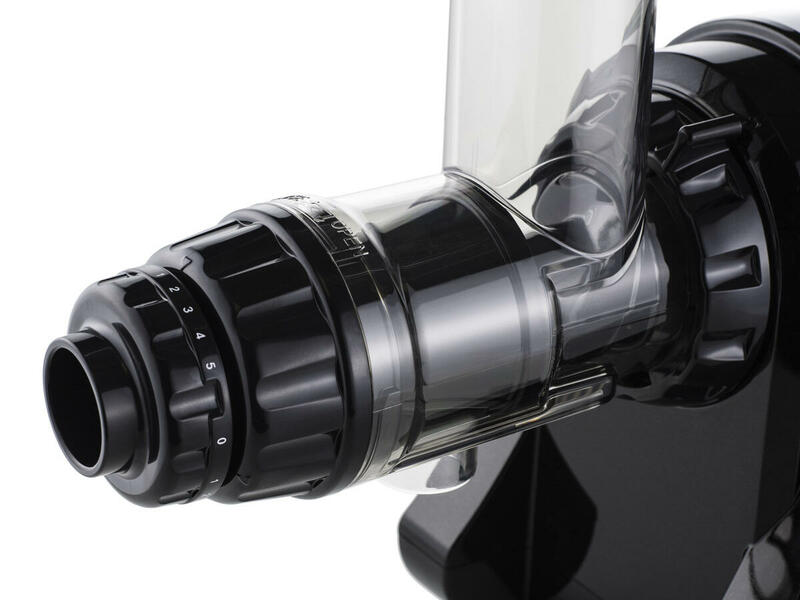 Overall, we really like the Vidia SJ-002 horizontal slow juicer. It is very easy to use, it performs superbly, is well-constructed, and is quite versatile with its homogenizing function. So how does it compare to the more expensive premium horizontals? Compared to our current favorite, the Sana 707, it has very similar performance. However, the Sana offers higher quality accessories (glass juicing bowl, stainless steel pulp container, coarse juicing screen) and an unparalleled level of construction and finish, especially the chrome model. The Sana also offers a much longer warranty, although based on our testing and the overall construction the Vidia should be highly reliable. For the price, the Vidia represents a superb value and should definitely be considered when comparing juicers.